On Wednesday, June 6th, volunteers came together using the Doobert.com software to transport a 2-year-old dog to safety in a rescue in Macon, GA. 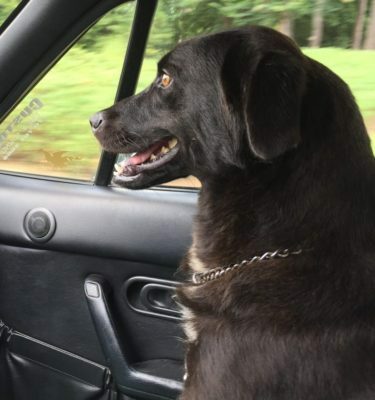 The owners of Biscuit, a black Labrador retriever, surrendered her and her litter of puppies to Northeast Georgia Animal Shelter in Lavonia, GA. Due to her age, adopters often overlooked her and the shelter placed her on the kill list. The dedicated volunteers of Rescue Transport USA united to drive Biscuit to Maine Lab rescue in Macon, GA where she is safe until her adoption. Thanks to these great volunteers, this sweet girl gets a second chance at finding a loving forever family. Rescue Transport USA takes animals from high kill shelters and transports them to rescues all over the country. These animals are then able to find their forever home and, once adopted, Rescue Transport USA can also assist with the transport to their new home. Their mission is to help animals and by transporting them, they are helping thousands of animals find their happy endings.